Hey everybody, Truffles here with another episode of Caturday Cinema! 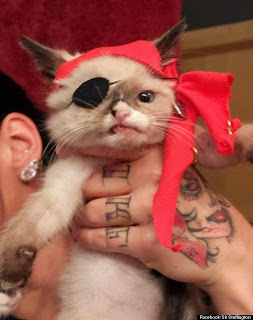 Today I'd like to introduce you to new Internet sensation Sir Stuffington, the one-eyed kitten. The 6-week-old's photo went viral thanks to a picture of him wearing pirate garb complete with red bandana, eye patch, and a precious little sneer. The little guy was born on the streets and suffered a raccoon attack. He also has other health issues including a disfigured jaw, heart murmur, upper respiratory infection, flea anemia, and the highly contagious calicivirus. He's currently in foster care and once his health is stabilized he will need to have several teeth removed to avoid future issues with the jaw fracture. His heart murmur and flea anemia have already been successfully treated. If you're interested in financially contributing to Sir Stuffington's recovery you can purchase adorable pirate-themed prints starring the popular kitten. All proceeds go to his recovery, as well as to other animals needing help at Multnomah County Animal Services. I hadn't seen this little guy and hope he goes on to live a long healthy life! I have a one-eyed cat and they're awesome. He is adorable. So sad he had a bad start to life. Wishing for a wonderful life for this guy. We just LOVE Sir Stuffington! We feel for the little guy as our own maxie came to us with tons of similar issues, including the calicivirus. (and he was totally deaf, and had lots of other health issues, but we digress, MOL!). Doesn't he make the BEST pirate EVER?